The Un-carrier launches unlimited for a generation of rule breakers. Bellevue, Washington — August 7, 2017 — The Un-carrier just did it again — eliminating a huge pain point for a generation of rule breakers that gave us the Mobile Era. T-Mobile (NASDAQ: TMUS) CEO and President John Legere just announced T-Mobile ONE™ Unlimited 55+, giving Americans age 55 and up the wireless they truly deserve. Starting August 9, qualified customers can get two lines of T-Mobile ONE — America’s best unlimited on America’s best unlimited network — for just $60, taxes and fees included, with Autopay. And that comes with unlimited talk, text and 4G LTE data along with great T-Mobile ONE benefits, making T-Mobile ONE Unlimited 55+ the best deal — hands down — for today’s modern, mobile adults age 55+. It’s such a sweet deal that we’re checking IDs! T-Mobile ONE Unlimited 55+ is the Un-carrier’s response to the way carriers treat the generation that created today’s wireless industry. The carriers’ insulting “senior plans” come with dumbed down phones and even more dumbed down plans, and the carriers give empty nesters no choice but to pay nearly 60% more per line when the kids move out and off the wireless plan. This generation deserves better! Boomers are the most long-term and loyal wireless customers, and yet, the carriers treat this generation like they’re stuck in the past. The carriers’ dumbed down phones and patronizing ‘senior’ plans assume they still live in a time before smartphones or the internet. AT&T’s ultra-patronizing “Senior Nation” Plan gives subscribers just 200 anytime minutes and 500 night & weekend minutes — and ZERO data. In fact, it’s limited only to basic phones only. No smartphones or tablets allowed. For real. We are not making this up. If that weren’t bad enough, the carriers demand you pay a higher price per line as soon as the kids move out and off the family plan. For example, moms and dads on Verizon who were once paying $45 each for four lines of unlimited (and getting slower) data — plus all those Verizon taxes and fees — could see the cost for each line jump to over $70 when they switch to just two lines. It’s just as bad for families on AT&T, who could see a nearly 60 percent price jump per line. With the carriers, customers have little or no choice — pay higher prices per line when the kids move off the family plan. Period. With T-Mobile, the choice is all yours. 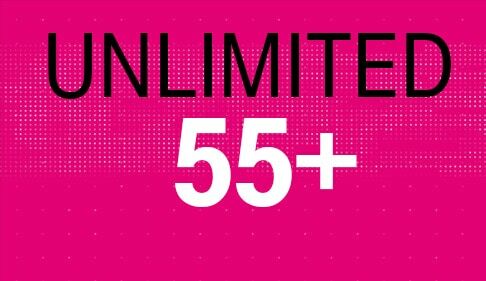 Choose T-Mobile ONE Unlimited 55+ to get unlimited wireless and pay an even lower price per line. The simple fact is that the carriers’ ‘senior’ plans simply don’t make sense for most of today’s modern, mobile adults. Nobody wants to be patronized with dumbed-down phones and limited services. And everyone wants a fair price that doesn’t require splitting the bill each month. With T-Mobile ONE Unlimited 55+, it’s just $50 for the first line of T-Mobile ONE and $10 for your second line with unlimited everything after $5 per line Autopay discount. Taxes & fees included. In short, it’s the wireless deal that the generation who created the Mobile Era deserve. With today’s announcement, T-Mobile is taking the fight to one of the carriers’ last strongholds. Among Americans age 55+, Verizon and AT&T collectively control nearly 81 percent of the postpaid wireless market. In contrast, just 8 percent of this group are with T-Mobile, compared to the Un-carrier’s 18 percent of all US wireless customers. That’s a LOT of people getting taken advantage of by the Duopoly — and a lot of people who can benefit from the Un-carrier. To get all this Un-carrier goodness and more, starting August 9, new customers age 55 and older can simply stop by your local T-Mobile store to sign up (we’re serious about checking those IDs*). Current eligible customers can get T-Mobile ONE Unlimited 55+ by calling 1.800.TMOBILE, going to https://www.t-mobile.com or visiting a local retail store. *Don’t even think about trying a fake ID, Gen Xers and Millennials. We see you. Video typically streams on device at 480p. On all T-Mobile plans, during congestion the top 3% of data users (>32GB/mo.) may notice reduced speeds until next bill cycle due to data prioritization. Tethering at max 3G speeds. Unlimited 55+: Postpaid only; at participating locations. Max 2 voice lines. Credit approval, deposit, and $25 SIM starter kit, or in stores & on customer service calls, $20 upgrade support charge may be req’d. Not eligible for Kickback, Insider Hookup, or some discounts. Includes 200 MB roaming. Without AutoPay, $5 more/line. Sales tax & regulatory fees included in monthly service price; see in-store materials for specifics in your state. As America's Un-carrier, T-Mobile US, Inc. (NASDAQ: TMUS) is redefining the way consumers and businesses buy wireless services through leading product and service innovation. The Company's advanced nationwide 4G LTE network delivers outstanding wireless experiences to more than 69.6 million customers who are unwilling to compromise on quality and value. Based in Bellevue, Washington, T-Mobile US provides services through its subsidiaries and operates its flagship brands, T-Mobile and MetroPCS. For more information, please visit http://www.t-mobile.com. Unlimited 55+. Link to view and download the asset in the Media Library.